To store the CSS rules, external CSS stylesheets are recommended. For example, the base CSS rules provided by Twitter Bootstrap CSS framework are loaded from bootstrap.min.css and bootstrap-theme.min.css files. Custom site-specific CSS rules can be stored in style.css file. Since you need this CSS stylesheets for most of your pages, it is better to link them in the head section of the layout template. But, if a certain CSS stylesheet needs to be loaded for a single page only, you place it on that page's view template. In the example code above, we used the appendStylesheet() method of the HeadLink view helper to add an external CSS stylesheet to the head section of the document. The method accepts a path to local CSS file (line 2) or a URL to CSS file located on another server (line 3). The summary of HeadLink view helper's methods is provided in table 6.2.
appendStylesheet() Puts a link to CSS stylesheet file after all others. offsetSetStylesheet() Inserts a link to CSS stylesheet file in a given list position. prependStylesheet() Puts a link to external CSS stylesheet file before all others. setStylesheet() Clears the list and puts the single CSS file instead. appendStyle() Adds a CSS stylesheet inline after all others. offsetSetStyle() Inserts a CSS stylesheet inline in a given list position. prependStyle() Puts a CSS stylesheet inline before all others. setStyle() Clears the list and puts the single CSS stylesheet inline instead. To demonstrate how to add a CSS stylesheet to your web page, we will take a real-life example. Assume you need to let the user the ability to type a date (in YYYY-MM-DD format) in a text input field. You would like to improve user experience by not just letting him to type the date, but also by selecting it from a pop-up date-picker widget. jquery-ui.min.css -- the minified version of jQuery UI theming styles. 17) jQuery UI provides a set of "user interface interactions, effects, widgets, and themes"; it is based on jQuery library. jQuery UI is analogous to Twitter Bootstrap in the sense that both provide reusable user interface components. 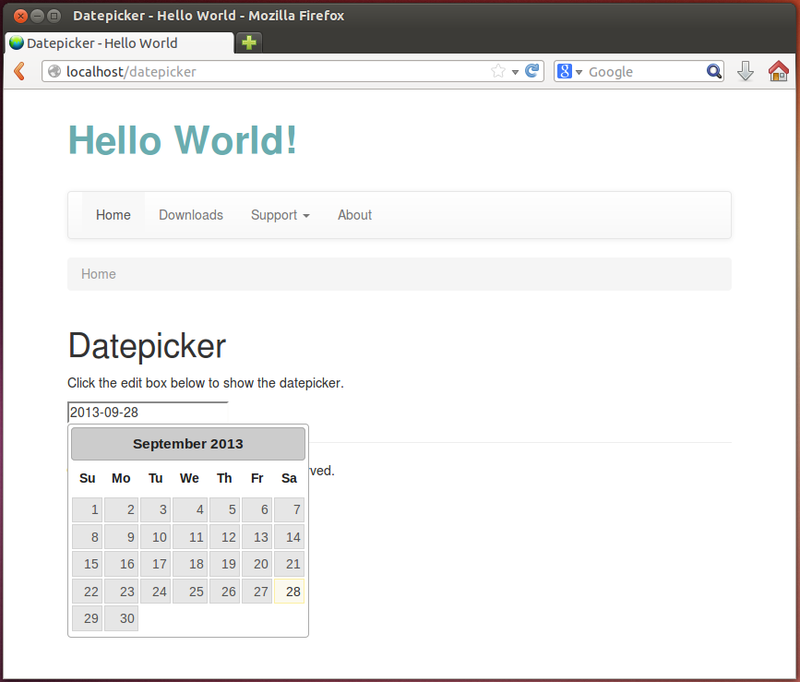 Click the edit box below to show the datepicker. In the example above, we use the HeadScript view helper's appendFile() method (line 4) to add the link to jquery-ui.min.js file to the head section of the document. In line 5, we used the HeadLink view helper's appendStylesheet() method to add the link to jquery-ui.min.css CSS stylesheet to the head section of the document. In line 14, we added the text input field which will be used to enter the date. To see the result, enter the "http://localhost/datepicker" URL into your browser's navigation bar (see figure 6.8 for example).